Size does matter, when it comes to this vac. I have a couple other of 12 gallon Ridgid vacs, and the suction on this one is noticeably better. The tools all store on board, although if your not careful, some will invariably fall off when you wheel it on rough terrain or stairs. Only other downside is that tipping and rolling it with the handle when it is full of water seems to be more than the handle was designed for. On the plus side, the suction is very very good. I first tested it in my shop with and without tools and it worked better than any shop vac I have ever used. I also like the longer cord, as it reached everything in my shop with only one reconnection. Even though it is a bit bulky with all of the tools loaded, the extra wheels allow it to have smooth mobility. We tried it in a home just painted and were able to move it through narrow halls without any bumping. Water suction is also good, and the extra capacity will certainly come in handy here. 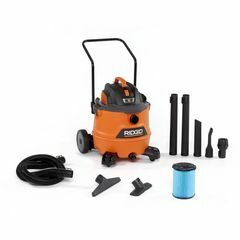 I was very pleased with the new Rigid 16 gallon vacuum, especially since they have made improvements in the cord length, and although I do not have a mechanical gauge set up to measure the suction, it is impressive and much improved over the older model I have used for the last several years. The onboard tool storage still leaves a lot to be desired, because any movement tends to leave a piece or two behind, and having to use every corner of the body to store the accessories takes away from tight storage, but this is not enough to detract from my 5 star rating. The removable head, allowing it to be a corded blower, is great for clearing the shop, and is not noisy enough to demand hearing protection. I also found it had enough force to air dry autos after power washing, to prevent spotting. My old vacuum did not have this much force. The barrel seals well, and the machine is dust free even after using it several times in the shop, only tapping out the filter, which was adequate as well. I highly recommend the shop van for anyone who actually uses a vacuum for more then occasional work. I am dedicating this one to the shop, and the older vac to the tool trailer. Great product! I received one of these for evaluation at no charge. I put it to work for a month at the cut station in a house we've been building that contains zero drywall--just knotty pine tongue & groove and half-log siding, several thousand feet of it. Used it in conjunction with an "autoswitch" as a dust collector for the miter saw, as well as for regular general cleanup. It performed admirably in both roles. Great suction, and next to nothing got past the filters. I used it with the optional VF-3502 dust bag for extra filtration and ease of emptying. Even with the dust bag full, there was no noticeable reduction in air flow. The unit comes with a lengthy cord and hose. All of the accessories have locking clips, so you never have that annoyance of having them pull apart unintentionally. Handy when you're pulling it around by the hose--and the wheels and casters make that almost effortless. Casters could be a bit larger to make it easier to roll over the cord when it's in the way, but that's a very minor issue. As others have mentioned, the stand-up handle isn't particularly robust. It's okay for moving the unit loaded with dry waste, but I wouldn't try that with a few gallons of water in it. The accessories are a basic set, but more are available for purchase separately. A brush head isn't included. You won't be able to run this vacuum in stealth mode, but it's not unreasonably noisy considering its size and power. Speaking of size, it's big. If you have limited storage space for when you're not using it, you might be wise to opt for a smaller model.